I have recently started cooking steaks at home and I really enjoy it. BUT I really hate the oil splatter all over my kitchen floor and stove top after I'm done cooking. I am already patting my steak dry and using very little oil. Would using a grill pan reduce this problem? I'm think it would as the oil will collect in the ridges as opposed to being caught between the meat and the pan. Yes, a grill pan will help some, for the very reason you have already identified in the question. Another advantage to a grill pan is charming grill marks. I don't think that's your best solution. If you like a serious sear on your steak, I don't think you can do better than a wickedly hot cast-iron skillet. (more on that: Why did my attempt at pan-searing beef filets fail miserably?) To mitigate spatter, I recommend a spatter screen. 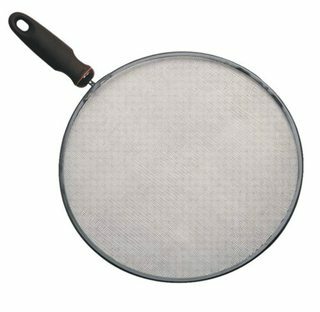 The surface is a fine mesh screen, it allows free exchange of air, but holds grease in the pan and away from your walls. Not the answer you're looking for? Browse other questions tagged oil pan or ask your own question. What type of oil is used in korean side dishes? how can I strip the surface from an iron alloy pan without harming the metal?